The Edinburgh Fringe kicks off today and I can't wait to head up there next week. This will be my 6th year at the Fringe so I like to consider myself somewhat of a Fringe veteran when it comes to planning a visit there. 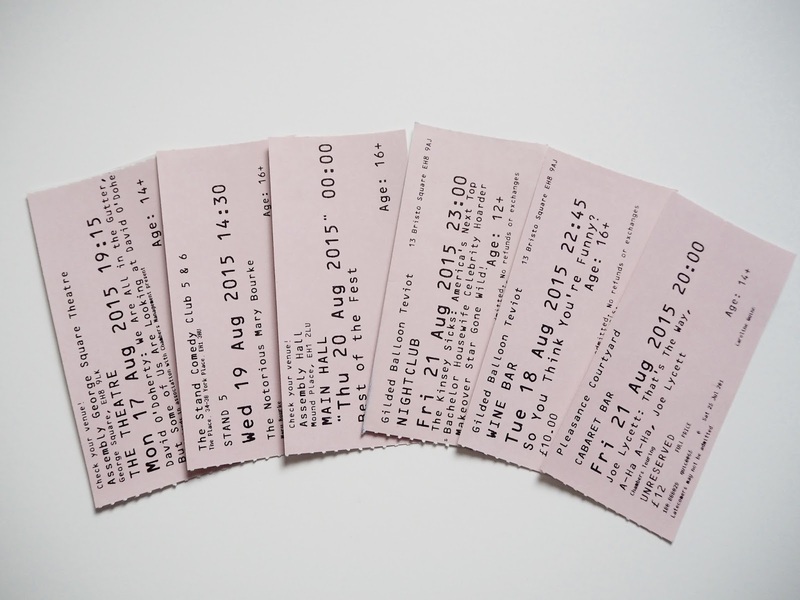 Here's 10 tips for getting the most out of your visit to the Fringe..
1. Book in advance any shows that you really don't want to miss out on but try to make sure to leave gaps. Part of the fun is some of the shows you'll come across whilst you're there. You might read a great review or get chatting with an enthusiastic comedian handing out their flyers and you want to be able to fit in seeing them. 2. When planning which shows you're going to go to make sure to leave gaps in between shows of at least 30 minutes. It takes time to walk between venues, some might be across the city and it could take a while to get a taxi during busy times. You don't want to have to leave the show you're at early to try and make it to the next, and you don't want to be sneaking in late trying not to be seen (and inevitably end up sitting on the front row!) Some venues have multiple rooms so even if your shows are based around the same venue allow time to find out where you need to go. 3. 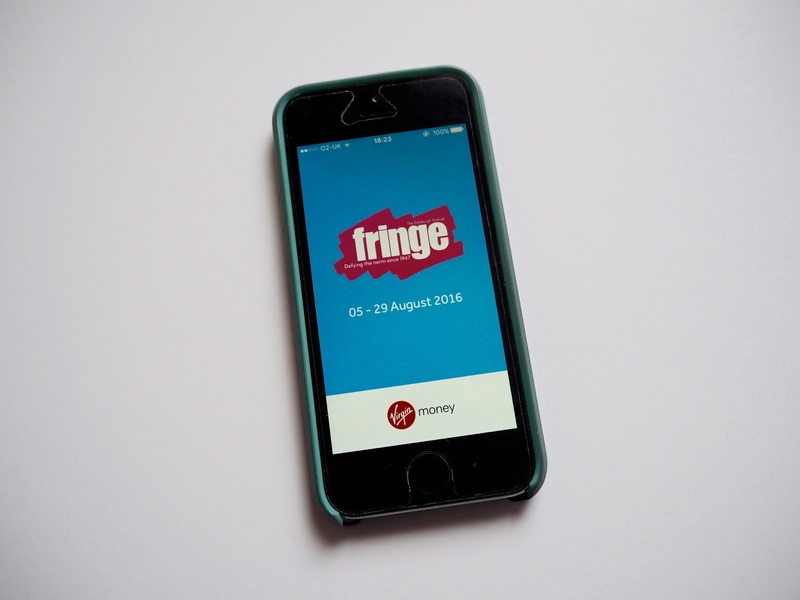 One of the best tools for planning a visit to the Fringe is undoubtedly the Ed Fringe app. The app makes it easy to browse and search for shows. You can add shows to your favourites and schedule them in your own personal planner. One of my favourite things about the app is the 'nearby now' feature which uses your location to display shows starting soon nearby. This is great if you've got a free hour or two and are wondering what to do next. 4. Wear comfortable shoes. It might sound obvious but you could potentially end up walking a lot between venues. There's quite a few hills and lots of cobbles so make sure to wear something suitable so you don't end up with sore feet halfway through the day. 5. Take a waterproof jacket or umbrella with you. In my experience (thinking back to the summer when it rained practically the entire week I was there!) the weather in Edinburgh can be quite temperamental, one minute it's pouring down and blowing a gale, the next the sun's back out and you're questioning if you need to apply suncream. 6. Wear layers! Fringe venues spring up all over the city and range from large auditoriums to tiny pop up cabins and they can get very hot with numerous people packed in so you want to be able to take your jacket or cardigan off. I watched Jenny Collier from the top deck of a very warm double decker bus back in 2014! 7. Visit the food trucks at Assembly George Square Gardens. Last year there was lots of great street food options including tasty gyoza's, fish & chips, burgers and you can sit and people watch (and no doubt be handed numerous flyer's!) If you're looking for something sweet stop by the crepe stand in the garden by the Gilded Balloon. 8. Go to see a compilation show. I really recommend 'Best of the Fest' for a chance to see a variety of acts. It's a great way to get a taste of whats on offer and should give you some inspiration for more shows you'll want to see. The lineups are released the day of the show on the Assembly website. 9. Many of the best shows I've been to have been part of the Free Fringe. Go along and discover some great comedians. Even though it's free you should give what you can afford (think how much you would spend on a ticketed show) Make sure you have change on you to put in the bucket at the end of the performance. I try to save £5 notes whilst I'm there to take with me. 10. Visit the Half Price Hut on the Mound to bag a bargain ticket. They're available the evening before and the day of the performances. You can also find out which shows are included via the app. Have you been to Edinburgh Fringe?